Technology - ALLEN L. BEEDE, O.D. & LISA Y. SHIROISHI, O.D. In keeping up with the latest technological advances and in striving to deliver better patient care, we are very excited to offer macular degeneration monitoring with the Foresee PHP device. The Foresee PHP offers a quick, painless test and provides information that is used to monitor patients with dry macular degeneration. The device is very helpful in assisting us with catching this disease right upon conversion to the rapidly-progressing, vision-threatening wet form of the disease, before irreversible vision loss occurs. A major reason for the devastating effects of macular degeneration has been a lack of effective monitoring tools to detect the conversion from dry to wet macular degeneration. Reliance on older, outdated techniques often results in diagnosis that is too late - after the disease has been wet for enough time that retinal damage and vision loss has already occurred. Treatment for wet macular degeneration works best early on, right when the condition converts to its wet form. If you or someone in your family has been diagnosed with macular degeneration please make sure an eye doctor is performing this state of the art technology on your family. Retinal photography is a must in optometric practices. It is essential in managing glaucoma. Photographic documentation of diabetic retinopathy patients helps us keep a data base of the progression of the disease, it's on going management and control. Retinal photography assists in the detection and management of problems such as diabetic changes, hypertensive (high blood pressure) retinopathy, macular degeneration, optic nerve disease, and retinal holes, thinning and/or detachments. We recommend that all our patients receive this test. It is especially important for people with a history of high blood pressure, diabetes, retinal diseases, flashing lights, floaters, headaches or a strong/high eyeglasses prescription. 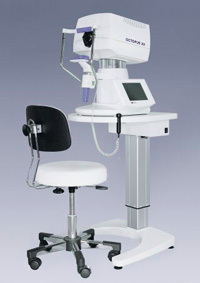 The GDx Nerve Fiber Analyzer is a high-tech diagnostic tool used in the defense against glaucoma. Glaucoma, usually is indicated by abnormally high pressure inside the eye, which can develop into blindness. Typically, screening for glaucoma involves examination of the intra ocular pressure (IOP) with a device called a tonometer. For at-risk patients, frequent and regular pressure checks help us monitor IOP, however IOP is not the only test used to determine whether or not a patient has glaucoma. The GDx can help us determine a patient's potential to develop glaucoma before tissue damage occurs, allowing us to consider treatment options long before other tests would have even diagnosed the disease. By examining the eye's nerve fiber layer, we can detect early changes in the structure of that layer. The nerve fiber layer starts to become thinner when glaucoma is present and it is this thinning that the GDx nerve fiber analyzer measures. The GDx nerve fiber analyzer is a specialized diagnostic laser and computer. This specialized testing helps us see signs of the disease much earlier than the visual field test, thereby enabling early treatment. It sometimes is possible to detect nerve fiber loss in the retina more than six years before visual field defects occur. The sooner glaucoma is detected, the better the chance of preserving vision. Visual Field Testing monitors peripheral vision. Visual fields are obtained to monitor visual changes that may be caused by specific eye diseases, such as glaucoma, as well as the neurological function of the retina, optic nerve and brain. While there are several types of visual field exams, the most common required patients to focus on one spot and respond to flashing lights by pressing a button. Your intraocular eye pressure (IOP) is important in determining your risk for glaucoma. If you have high IOP, careful management of your eye pressure with medications can help prevent vision loss. Sonogauge is a pachymeter that measures the thickness of your cornea and helps us better understand your IOP readings. After your IOP is determined, we will develop a treatment plan that is right for your condition. The procedure takes only about a minute to measure both eyes. 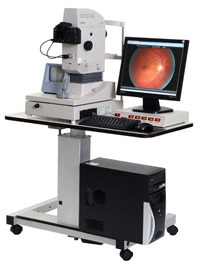 Corneal Topography provides a mapping of your cornea. This may be required for certain eye conditions, prior to refractive surgery, or for specialty contact lenses. A corneal topographer is a computer linked to a lighted bowl with a pattern of concentric rings inside it. The patient sits at the bowl with their forehead braced against a bar. The technician has only to line the patient up properly and snap an image. The procedure is painless and very fast. The computer then uses the snapped image to produce a printout of the corneal shape using colors to identify different depths much like a topographic map of the earth describes changes in the land surface. 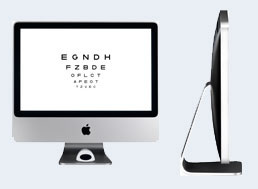 iMac Haag Streit acuity system replaces the old projector acuity chart. This new acuity system allows the patient to more easily distinguish the prescription that works best for them.